PRODUCT: 3M Scotch-Brite Pad, Maroon Color Very-Fine Grade for General Purposes. Pad size 6" x 9". Price/Pad. 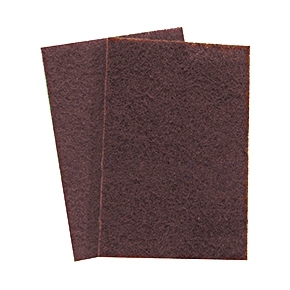 Type-A, Very-Fine grade, Scotch-Brite General Purpose Maroon color Pad. Ideal for applying EPDM/TPO primers, and scuffing / cleaning roofing membranes such as EPDM or TPO. Surface Conditioning Pad for scuffing before applying paint and primers. Rinse clean: Can be used several times. Pad size 6" x 9".